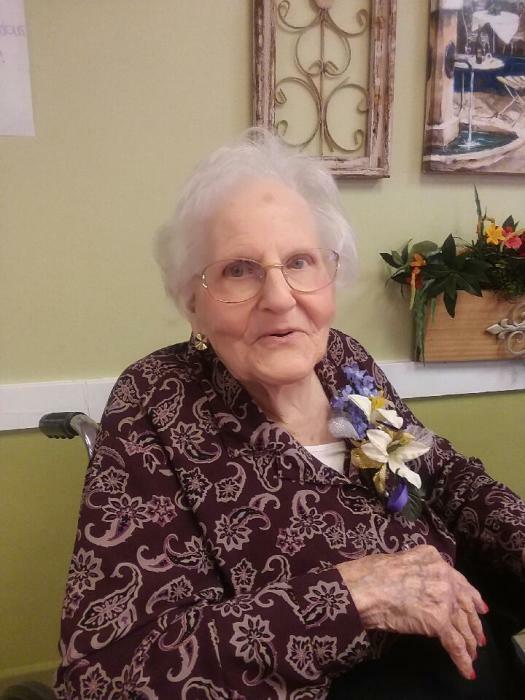 Obituary for Viola M. (Finke) Basso | Williamson Funeral Homes, Ltd.
Viola M. Basso, 96 of Staunton, Illinois passed away Wednesday, August 22, 2018 at Hitz Memorial Home in Alhambra, IL. Born February 26, 1922 in Edwardsville, IL, she was a daughter of the Late William & Marie (Bruene) Finke. She married Andy Kuba in 1941 and he passed away in 1949. She then married Joseph Secco in 1950 and he passed away in 1973. Later, she married Guido Basso in 1974, and he passed away on November 9, 2008. She was a homemaker and a member of Zion Lutheran Church of Staunton. She is survived by 1 Daughter, Vickie Blaine of Collinsville, IL; 2 Sons, Larry Kuba of Staunton, IL and Roger (Jane) Kuba of Westfield, IN; Grandchildren, Alison (Vince) Hasquin of Staunton, IL; Scott Lorsbach; Andy (Jennifer) Kuba of Ohio; Kyle (Patricia) Kuba North Carolina; Jamie (David) Thornton of Oswego, IL; Connor (Natalie) Kuba of Georgia; Great Grandchildren, Eric & Emily Hasquin; Lindsey Lorsbach; Megan, Kaitlyn, and Evan Kuba; Bryce Thornton; Lucy, Maxwell, Jack, & Charlie Kuba; Jacqueline, Vivian, and Zack Kuba; 2 Step-Siblings, Frank Lloyd Hueneger of Moro, IL and Melinda Whittaker of Wood River, IL. Besides her parents and husbands, she was preceded in death by 1 Daughter-in-Law, Sharon Kuba; 3 Brothers, Louis Hueneger, Chris Hueneger and Harold Finke; 3 Sisters, Hulda Oglesby, Ruth Haynes, and Esther Jacobi Eller. Friends may call from 11 AM to 1 PM on Saturday at Williamson Funeral Home in Staunton. Funeral services will follow at 1 PM at Williamson Funeral Home in Staunton with Rev. Kelly Mitteis officiating. Burial will be held at Worden Lutheran Cemetery in Worden, IL. Memorials are suggested to either Zion Lutheran Church of Staunton or to the Alzheimer’s Association.